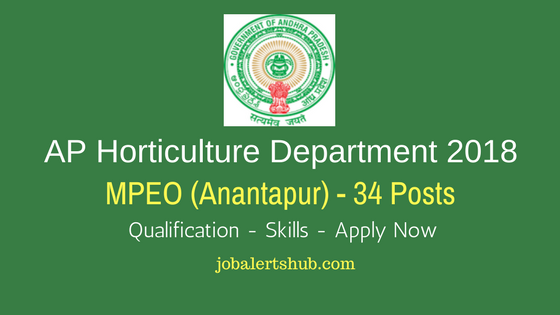 The Andhra Pradesh State Horticulture Department has announced new vacancies for MPEO posts for Collector & District Magistrate, Ananthapuramu for Horticulture Department in Ananthapuramu district. Under AP Horticulture Department 2018 MPEO job announcement, candidates from the native of district and those who completed degree in relevant discipline will be preferred for the post. A total number of 34 Vacancies were announced for the MPEO posts. And selected applicants for the vacancies will be filled based on qualifying exam and rules as per reservation. Selected job aspirants for the announced MPEO post vacancies in Horticulture Department in Ananthapuramu will receive pay of Rs 12000/-. Name Of The Posts: MPEO. As on 01- -2017, candidate should have 18 to 40 years. For SC and ST candidates will have age relaxation of by 5 years. Education Qualification: Job applicant should completed B.SC or higher qualification in relevant disciplines. Selection Process: Final job aspirant for the announced vacancies will be selected based on qualifying exam and as per reservation per govt. rules. Interested candidate need to fill the application form in prescribed format, and attest required documents mentioned in the notification and send it to provided address before last receipt date.